Right now my kitchen smells AMAZING. I am making Basic Vegetable Stock. This is such an easy recipe that there really no reason not to make your own. Just chop – Throw it in the pot – Simmer. EASY. 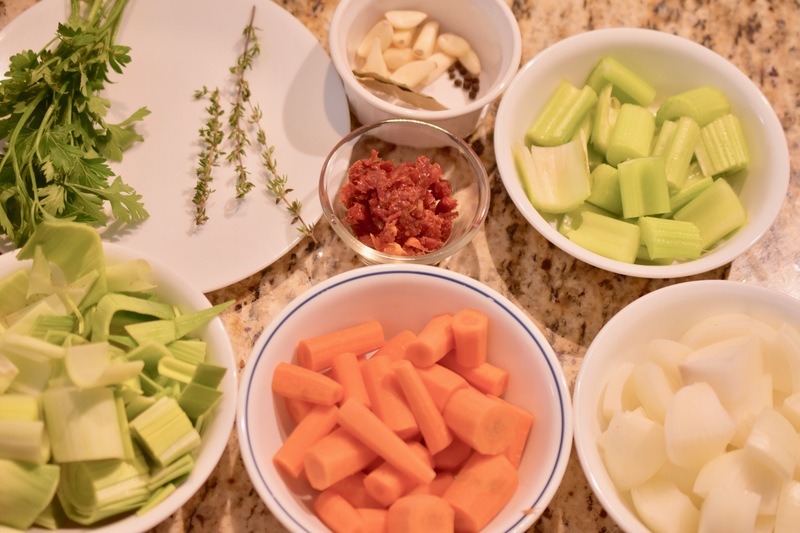 Add all the ingredients to a large stockpot. Bring to a boil. Reduce heat to a simmer. Simmer uncovered for 60 – 90 minutes. Allow stock to cool for about 20 minutes. Pour through a fine mesh strainer over a medium bowl. Let cool and then transfer to a sealable container and store in the refrigerator. I have not used my instant pot as much as I could. It is still a new tool for me, and I am used to stove cooking, letting a pot of beans or a soup slowly simmer on the stove, as the smells waft throughout the house. Utilizing the Instant Pot only makes sense since I live in Florida. Right now it is extremely hot and humid in this southern state. 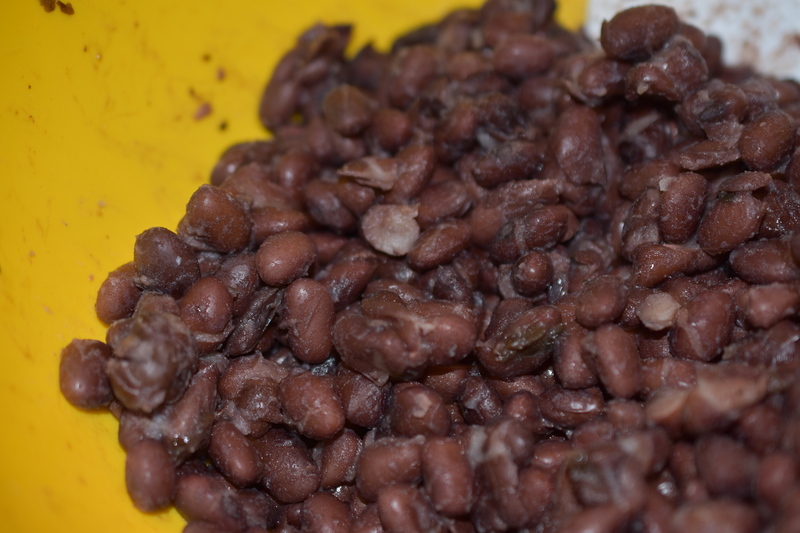 I thought I would give it a whirl and try to make basic black beans in the Instant Pot. I purposely left out the seasoning so that I could divided them into 1 1/2 c servings and use them any way I so desired. Something like brownies or tacos. Each of these has completely different flavor profiles. Thus, different seasonings, and that is why these are not seasoned. Sometimes I am amazed at how easy and quick the Instant Pot makes batch cooking. Batch cooking is one of my favorite ways to put a meal on the table in minutes. Make a pot of rice or quinoa. Roast a couple of sheet pans of assorted vegetables in the oven. And, make an instant pot of beans. 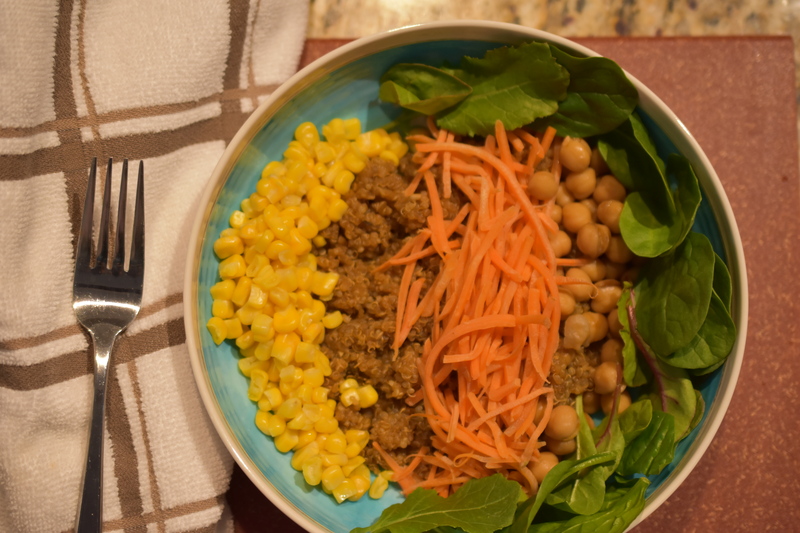 You have the makings of a tasty and nutritious Buddha Bowl. Combine all ingredients into the Instant Pot. Secure lid and make sure pressure valve is set. My Instant Pot directions call for 20 minutes of cooking time. Do a 7 bean tenderness check. The beans are done when all seven beans are tender to eat. If they are not tender, just cook them a little longer in 5-10 minute increments. You do not want them to turn out mushy. Mine took 30 minutes to be done. Note: Kombu is great for infusing foods with alkalinizing minerals. It also tenderizes legumes helping with digestion. Cooking rice is very simple once you get the rice and cooking liquid ratios correct. The stove top method is easy and a mostly hands-off process. This method turns out perfectly cooked rice every time. Simple, is the word for making this rice. 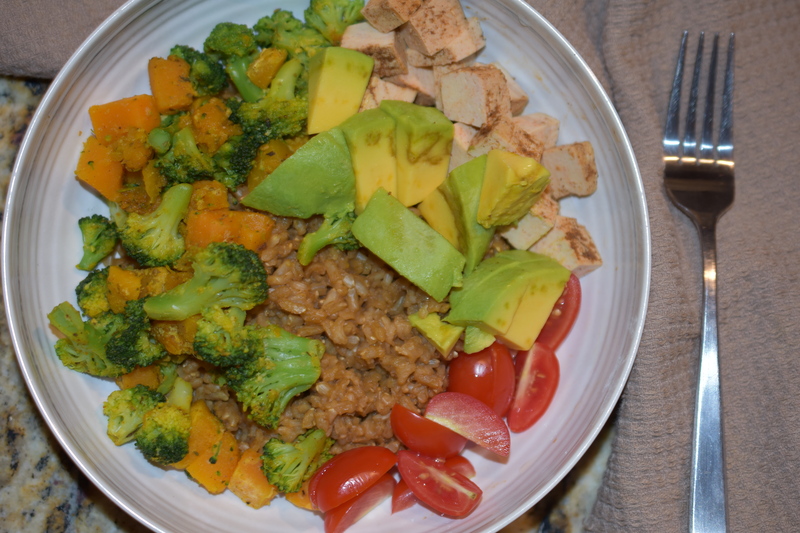 Add your ingredients into a pot, check it periodically and there you are making perfect brown rice. Note: This recipe makes 3 cups of cooked brown rice. When I make a larger batch I do add just a little more liquid (ex. 1 pound of rice to 5 cups of vegetable broth). Add ingredients to a large dutch oven. Stir rice and broth. Cover dutch oven with a lid. Bring rice to a boil over medium heat. Turn down temperature so the broth is at a simmer. Cook until all the broth has been absorbed by the rice. Let rice set for about 10-15 minutes, then fluff rice with a fork. It has been a little over a year when I brought to you how to roast a whole chicken. This is a little different version with an orange twist. Not only did I add the aromatic fragrance of orange, I also added compound butter under and on top of the skin. The compound butter adds so much more flavor and helps the skin to crisp up to a delectable goodness. Also, I used my cast iron skillet to roast the chickens. I have not done this before. I usually use a large roasting pan. I am actually roasting two chickens instead of one. Why not? It takes the same amount of time and it gives me more chicken to use in future meals. Let’s see: Chicken pasta dish to take to the in-laws for dinner. Maybe some chicken salad for lunch. Cannot forget to make homemade chicken broth out of the bones. Chicken soup sounds pretty good too. All of these wonderful meals out of two chickens. Let’s see how many meals we can think of. Drizzle olive oil into bottom of skillet. Pat dry chickens. Insert orange half into the cavity of each chicken. Also add about 2 tbsp of the compound butter into each of the cavities. Separate skin from the chicken and spread some compound butter in between the meat and skin of the chicken. This step adds so much more flavor than not adding any of the compound butter. Do this to each of the chickens. 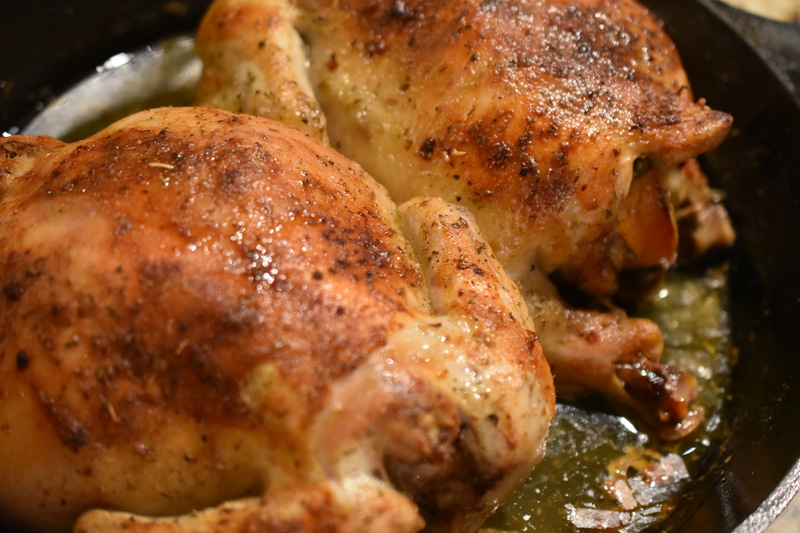 Place chickens into a large cast iron skillet. Massage some compound butter on the skin of the chickens. Drizzle some olive oil on the skin. Generously sprinkle all-purpose seasoning on the outside of the chicken. Roast chickens for 30 minutes at 400 degrees. After 30 minutes, reduce heat to 350 degrees. Continue to roast chicken for about another hour, or until a thermometer reads about 150-160 degrees. About midway through the roasting time baste the chicken with the juices in the skillet. Remove from oven and cover with foil to rest. The chicken will continue to cook while it is resting. Resting the chicken is important so that you have a juicy, succulent bird. Serve. Eat. Enjoy. 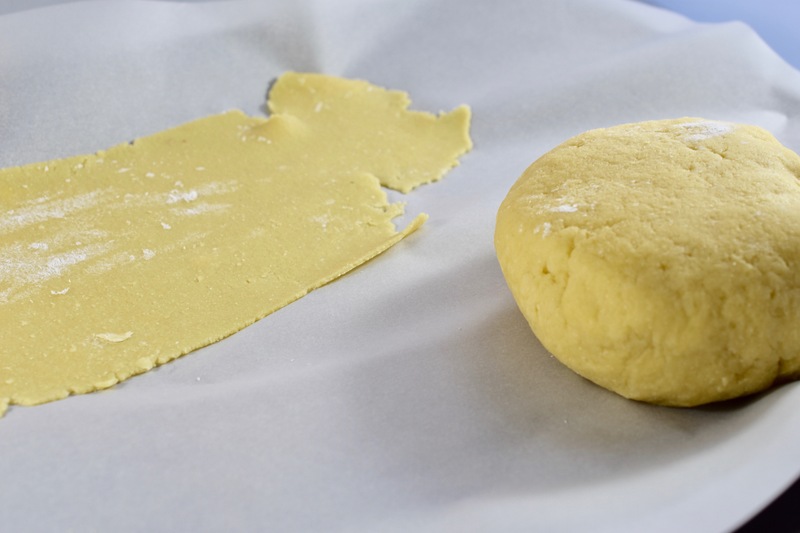 Compound butter also known as flavored butter is one of the easiest ways to pack a punch of flavor in any dish. You can make the butter savory or sweet. I have made both and thoroughly enjoy each and everyone I have made. I made this savory version because I plan on roasting two chickens tomorrow. Two chickens? Well, it is just as easy to roast two chickens as it is to roast one. Then I will have plenty of chicken for various meals this coming week. Sorry, back to topic. It only takes about 5 minutes to makes this flavored butter. See how easy it is. Combine all ingredients into food processor. Blend ingredients until well combined. Spoon butter mixture on to waxed paper. Roll into a log. Twist ends and fold. 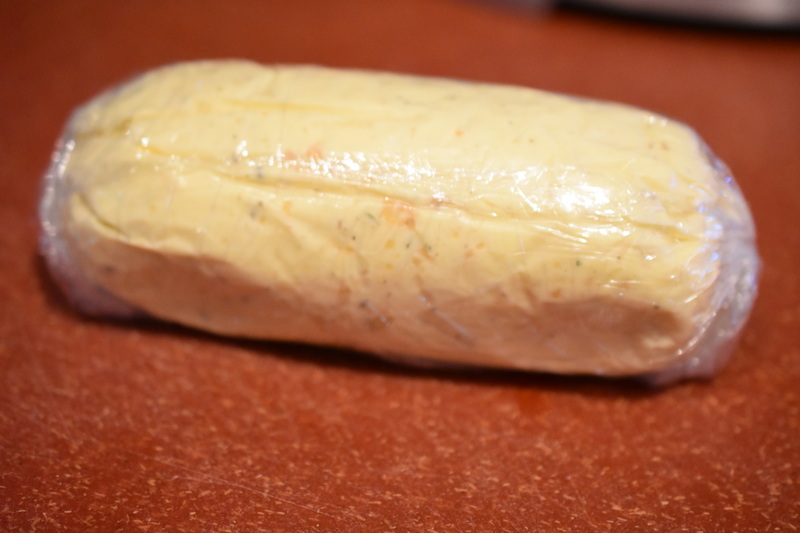 Wrap butter in plastic wrap. Refrigerate until use. Note: You can slice off as much as you want to use. Also, you can freeze the butter until needed. 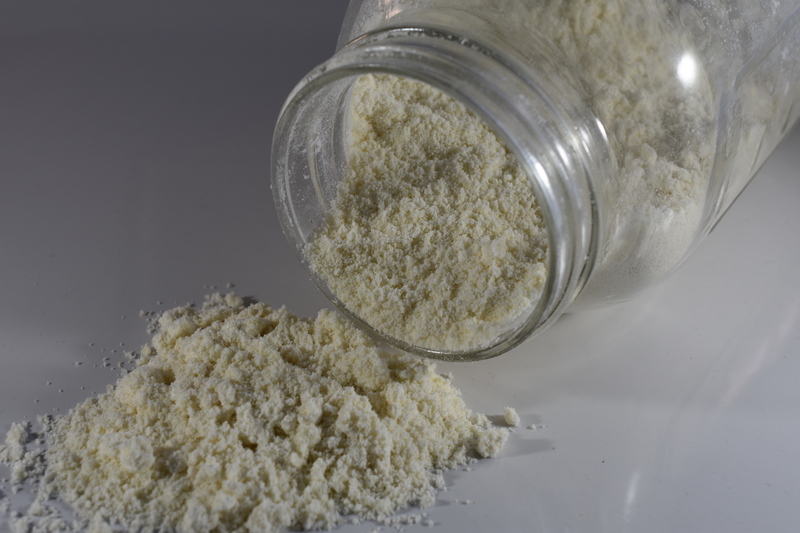 Depending on the type of cake you are baking, the recipe may call for all-purpose flour or cake flour. So far I have developed an all-purpose flour blend, a self-rising flour blend and now a cake flour blend. I am very happy with the results of all the flour blends. 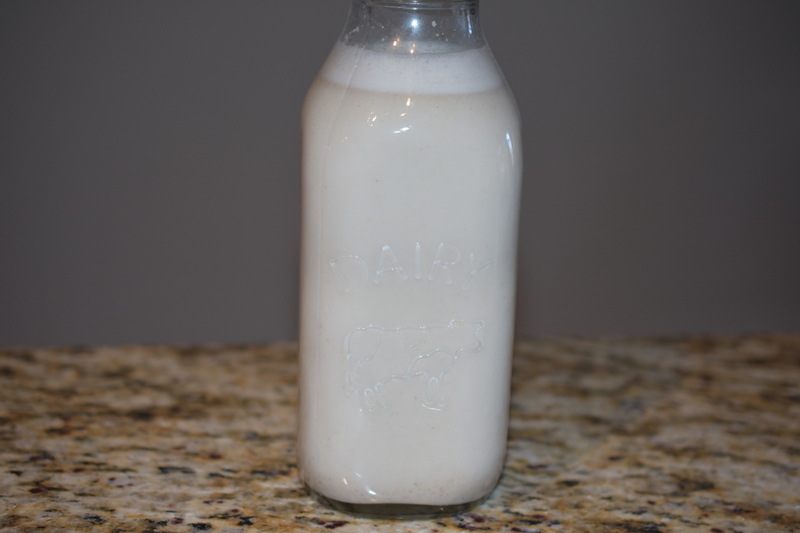 It makes baking grain-free and gluten-free so much easier. This recipe should also work with traditional flour. Sift well. Store in a sealable container in a dry place. I would love to see some pics of the things you have baked with the flour blends.